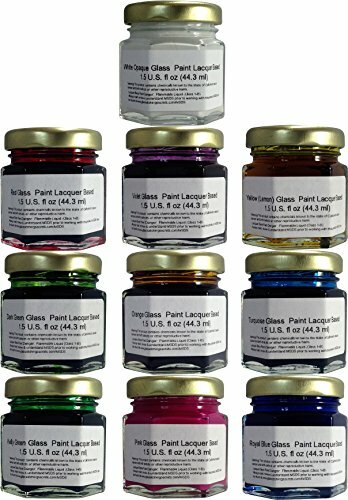 Permanent Glass Paint Lacquer Stain Kit, 10 Pack, 1.5-ounce Professional Stained Glass Finish by DIY Gateway at JC Water Colors. MPN: 10-1-5GP. Hurry! Limited time offer. Offer valid only while supplies last. Looking for a glass paint that is more superior for professional, artistic stained glass-like quality? Try these lacquer-based glass stain paints. Looking for a glass paint that is more superior for professional, artistic stained glass-like quality? Try these lacquer-based glass stain paints. Most paints are enamel based which don't adhere as well or provide consistent coats. This translucent glass paint set provides colors in royal blue, turquoise, light (Kelly) green, dark green, violet, orange, pink, red, lemon (yellow) and opaque white. Please note: White and Pink colors have some product settling on bottom of jars and require stirring before each use. If used by airbrush, paint must be thinned and/or used with a wider nozzle tip. *Paints produce fumes during application and dry time. Use in well-ventilated areas. Lacquer based for superior stained glass look. Stains the glass nearly identical to real stained glass. Translucent, transparent glass paint stain. Deep, vibrant colors can be applied with a glass stain dropper, brush, sprayer or airbrush. View More In Paint Finishes. If you have any questions about this product by DIY Gateway, contact us by completing and submitting the form below. If you are looking for a specif part number, please include it with your message.